Oh man….it’s been awhile since I’ve felt called to write here! I tend to write in smaller bursts on Instagram than in longer posts here, but as the intensity of summer fades into the slower rhythm of fall, the voices around me are growing louder. It’s time. Time to get back to this work. Time to listen. Time to share. It’s a cycle – sometimes I need some space to integrate and make shifts in my own life before I know what’s next. That makes it hard for me to keep up with any kind of writing schedule – I share when the information makes itself known and I am asked to share. And sometimes that means months between blog posts. So, what’s been happening in my world this summer? First, I’ve had some interesting light upgrades. The most recent one happened over the weekend so it’s fresh in my mind, but in both cases (that I recall), I wake in the middle of the night to the sensation of a huge amount of light flooding in through my head. It’s paralyzing and all I can do is lay still and do my best to absorb and anchor the energy. I also feel like I’m receiving some healing energy when this happens, or releasing old energy. When it happened a few months ago, I was literally ROARING the energy through and out of my body. In that case, it all took place in a dream state, but I woke up as soon as it was over and felt like I had been “deposited” back into bed after a very real experience. During this last one, I was completely awake and conscious of everything as it was happening. Somewhat related to this, my day time and dream time are getting more fluid. I have always known that I travel in my dreams, but lately it seems that I often am not completely back in my body when it’s time to wake up. This leaves me in a bit of a fog for a few hours, trying to get myself back in the right place and the right time. Not so bad if I’m able to be at home during that time, but attempting to participate in a business meeting is downright torture! Are you having any of these kinds of experiences too? I found this 2013 article from Lisa at Awakening to Remembering that touches on the nighttime light upgrades and this waking and sleeping cycle “flipping”. I’ve also been drawn lately to sound healing. I’m finding the desire to tone when I do healing work (and sometimes just because) and have been experimenting with a small singing bowl that I was gifted some time ago. I’m sensing the effect sound has on shifting energy in our bodies and see that it can be a powerful healer. As I’ve been diving into this, the universe delivered the most perfectly timed Shamanic Star Sound course with Rachel Webb – it starts this week if you’re interested in joining us. I’m curious to see how this connects with the work I’ve already been doing – the trees REALLY enjoy singing and music! And I tell you all of that to say that it was Rachel, earlier this year, who said to me that intuitively something wasn’t quite right in how I describe my work on my website. I say that I “work with the spirits of the land…” and she was like nahhhhh….it’s way more than that. We both thought about it a bit and couldn’t quite pin it down but she said something about the land speaking through me. And that felt really scary and presumptuious for me to say. Who am I to speak for the land? So she dropped it, and then I forgot all about the conversation for a few months. Around that same time, my guides were telling me that my time sharing property readings was done. They didn’t tell me what was next, just that I needed to remove that offering from my website for the time being. I did as I was told, removing the information from my Services page and turning off my appointment booking service so I wouldn’t pay the monthly fee while I waited to see what was next. A few times this summer, people have reached out to me directly to ask if I can do a reading for them and each time I have thought….ehhh….what can one reading hurt? And each time my guides have said NOPE! No readings. And I have complied. So imagine my surprise a few weeks ago when I receive an email saying that someone booked a property reading on my website. Umm…that’s literally not possible. So I check my website and, sure enough, the offering is back online. So I check my appointment booking service and it’s definitely turned off. It should not have allowed any sessions to be booked, yet it did. But this turned out to be a very unique property who’s caretakers had a very important, time-sensitive need and I was grateful to be able to share the information with the stewards of that land. I guess my guides have become the gatekeepers for property readings and I assume the readings I am meant to do will continue to find their way to me, in whatever way is necessary for them to get my attention! Anyhow, fast forward a few months from my chat with Rachel and I was feeling a pull to spend some time in the back portion of our property. I really love it back there – it sits much lower than our house and is in the shade of Douglas fir and Tamarack trees. I carried a blanket and a journal back there one afternoon and started writing. I asked myself the question: Why nature? What is it about nature that pulls me in? What, specifically, is my gift when it comes to nature? But I realized that it’s nothing like what I feared when Rachel first mentioned it. It’s not that I’m some kind of oracle talking for the land. In fact, it’s similar to something I’ve shared before about working with nature spirits. Sometimes they ask us to do things for them with our human bodies that they can’t accomplish. Like pickup a piece of trash sitting on their roots. Or prune back a branch rubbing them in the wrong way. They don’t have arms and legs like we do, or voices that are the same as ours. Can we all tune into these energies and hear these stories for ourselves? Yes. But can the land also tell stories to me that I can share with all of you here? Of course! The information I received that day was that I was to ask each piece of land that comes to me to tell it’s story. The content of the story is not as important as the fact that they are heard. Not all are long stories, but many are sad stories. Most are just neglected by us humans. But the healing is in the listening. In many cases, the gifts of the land have simply not been acknowledged or appreciated or worse, their gifts have been exploited. Much of the land is simply sad to have been used without regard until it is no longer needed. So this is what is next. 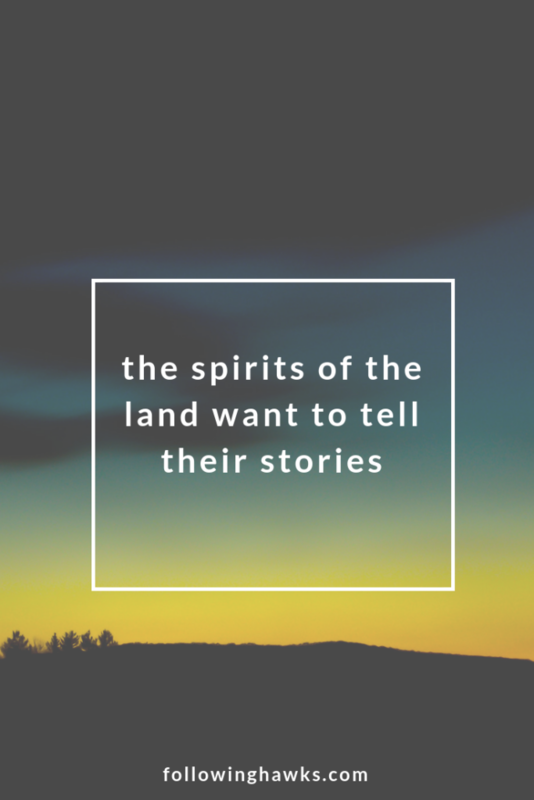 Telling the stories of the land so they may be heard and released. I sent an email over the summer to those of you on my list asking for suggestions for properties who want their stories told. This is not so much to relay messages from the land to the people living there at the moment (although perhaps that will happen anyway), but an opportunity for the spirits of the land to say whatever it is they need to say. I won’t be charging for this, but I will be sharing the stories here. I plan to do these at my own pace (whatever that turns out to be) and in whatever order the stories want to be told. Send me an email if you have a suggestion for a property or area of land – it can be public or private – although I will keep names and addresses of private property confidential and only share the city. My guess is that the stories will not be so “address specific” as it’s us humans who have carved up the land into little tiny chunks for us to each live on. Often, the spirits have a hard time when I’m asking them questions in readings to keep the information to one specific location. They don’t know that the grandfather tree is actually on the other side of a fence or that a shed that needs some energy work belongs to a neighbor. So I’m curious to see how the information is shared when I’m asking them to give me their story. I’m excited for this next phase in my education with the spirits of the land and look forward to sharing it all with you. Much of this artical resonates with me. Thank you for sharing. I will check out Rachel as well because I”ve has a few light downloads , not knowing what they were until now. I also have the same pull to my land, especially down the back near the barn. I may have to go back there and journal as you did. Thank you! You did a property reading for me a while back. I am happy to add my land to the list for its story to be told. My Address is 9 David Drive, Pelham NH 03076.